Me and my friend Christina had a creative get-together last year. We made accordion books out of folded paper. Then we added in tape, collage and words. We had wine and food too, and it was very inspiring to create together. This time I suggested embroidery, and allthough she was a bit hesitant, because it’s not something she have done since school, she said yes. “The Creation”. Angelina fibers, stitches and some beads for the glimpse of light in the middle. Awesome free form embroidery start if you ask me! Last month I visited a knitting café (and cast on for striped socks), last week the embroidery café (stitching on my TAST-sampler) and this week my embroidery group got together. Strawberry cake, lots of talk and planning for fun things happening during summer and this autumn… It was the last meeting before summer, and we exchanged “summer kits” for making our own ATC during the summer. It’s the third year we do this, so now it’s a tradition and I enjoy it a lot! 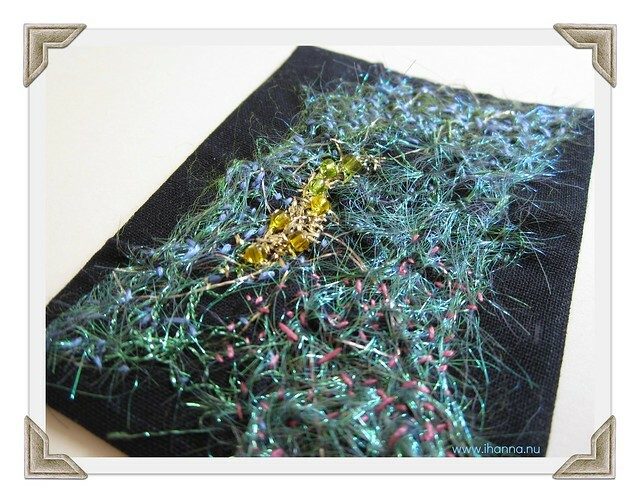 This entry was posted in Other's Creativity and tagged angelina, ATC, creating together, embroidered atc, free form embroidery. Bookmark the permalink. Oh wow, these are reallllllly lovely. The third atc – the one with the universe – reminds me of pictures from a paleontology museum. You have knitting and embroidery cafes up there?! I’m awfully jealous (?!). When I knit or embroider in public, people usualy avoid me … well, except drunk men … but that’s another story. My so called “group” just called it quit for entire summer and better part of autumn. I’m probably only person there without tremendously large vineyard to take care of (and a 9 to 5 job). All this “crafting together” seems so funny!!! I really link the pink ATC! How lovely to have a friend to craft with like this. The ATCs are all super! This looks like it really was a fun time, and to do an ATC kit every summer – love that! The pink one is my favorite, I just love trees! 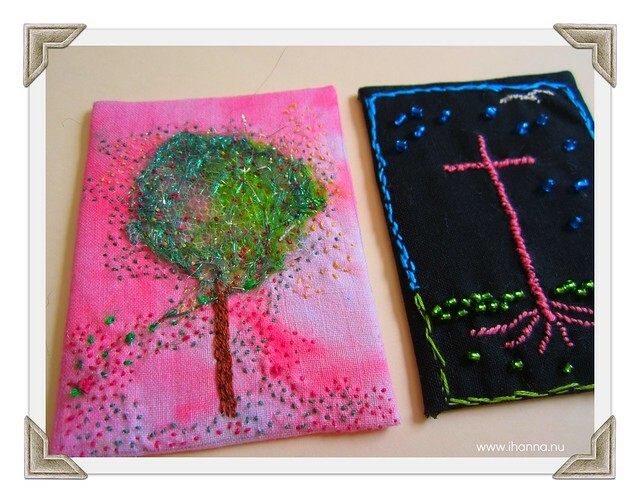 I love your embroidered tree! I must admit that I’ve never done embroidery, not even in school. But your free-form embroidery is so much different from what I always thought embroidery was like, I’m actually starting to think about giving it a try.